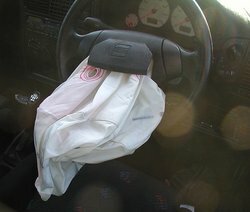 An automobile airbag, like this one in a crashed SEAT Ibiza car, deflates after 0.3 seconds. An airbag is a flexible membrane or envelope, inflatable to contain air or some other gas. Air bags are most commonly used for cushioning, in particular after very rapid inflation in the case of an automobile collision. It was marketed for automobiles first by Allen Breed in 1967, to Chrysler, after his invention of the ball-in-tube sensor for crash detection. There have been airbag-like devices for aeroplanes as early as the 1940s, though the first actual example in a production car was in 1974, when dual airbags were an option on several full-sized Cadillacs, Oldsmobiles, and Buicks. The design is conceptually simple—accelerometers trigger the ignition of a gas generator propellant to very rapidly inflate a nylon fabric bag, which reduces the deceleration experienced by the passenger as they come to a stop in the crash situation. The bag has small vent holes to allow the propellant gas to be (relatively) slowly expelled from the bag as the occupant pushes against it. On July 11, 1984, the U.S. government required cars to have driver's side air bags or automatic seat belts by 1989. 15,000 lives have been saved by air bags in last 20 years since. Initially, most vehicles featured a single airbag, mounted in the steering wheel and protecting the driver of the car (who is the most at risk of injury). During the 1990s, airbags for front seat passengers, then separate side impact airbags placed between the door and occupants, became common. Most jurisdictions now explicitly require at least driver airbags in all cars, or set passenger safety standards that can only be met by their use. Statistics show that passengers in cars fitted with airbags have approximately 30% less chance of dying in an accident than in comparable cars without airbags fitted. Despite this, airbags have occasionally caused controversy, as the initial expansion of the bag is in itself a violent event, and if an individual is too close to the airbag when it is initially triggered they can be seriously injured or killed. This was partly due to American airbag designs triggering much more quickly than airbags designed for other countries, to protect occupants not wearing seat belts. Newer airbags trigger slightly less violently; nonetheless, passengers must remain at least 25 centimetres (10 in) from the bag to avoid injury from the bag in a crash. Smoking a pipe in a seat protected with an airbag should be avoided: if it inflates and hits the pipe while it is in the mouth this may well be deadly. Automobile airbags are supplemental restraints, and operate best when the occupant is also using a seat belt. Air bags supplement the safety belt by reducing the chance that the occupant's head and upper body will strike some part of the vehicle's interior. They also help reduce the risk of serious injury by distributing crash forces more evenly across the occupant's body. The air bag system consists of three basic parts-an air bag module, crash sensors and a diagnostic unit. Some systems may also have an on/off switch, which allows the air bag to be deactivated. The air bag module contains both an inflator unit and the lightweight fabric air bag. The driver air bag module is located in the steering wheel hub, and the passenger air bag module is located in the instrument panel. When fully inflated, the driver air bag is approximately the diameter of a large beach ball. The passenger air bag can be two to three times larger since the distance between the right-front passenger and the instrument panel is much greater than the distance between the driver and the steering wheel. The crash sensors are located either in the front of the vehicle and/or in the passenger compartment. Vehicles can have one or more crash sensors. The sensors are typically activated by forces generated in significant frontal or near-frontal crashes. Sensors measure deceleration, which is the rate at which the vehicle slows down. Because of this, the vehicle speed at which the sensors activate the air bag varies with the nature of the crash. Air bags are not designed to activate during sudden braking or while driving on rough or uneven pavement. In fact, the maximum deceleration generated in the severest braking is only a small fraction of that necessary to activate the air bag system. The diagnostic unit monitors the readiness of the air bag system. The unit is activated when the vehicle's ignition is turned on. If the unit identifies a problem, a warning light alerts the driver to take the vehicle to an authorized service department for examination of the air bag system. Most diagnostic units contain a device that stores enough electrical energy to deploy the air bag if the vehicle's battery is destroyed very early in a crash sequence. Some vehicles without rear seats, such as pick-up trucks and convertibles, or with rear seats too small to accommodate rear-facing child restraints, have manual ON/OFF switches for the passenger air bag installed at the factory. ON/OFF switches for driver or passenger air bags may also be installed by qualified service personnel at the request of owners who meet government-specified criteria and who receive government permission. Air bags are typically designed to deploy in frontal and near-frontal collisions, which are comparable to hitting a solid barrier at approximately 8 to 14 miles per hour (mi/h) (13 to 23 km/h). Roughly speaking, a 14 mi/h (23 km/h) barrier collision is equivalent to striking a parked car of similar size across the full front of each vehicle at about 28 mi/h (45 km/h). This is because the parked car absorbs some of the energy of the crash, and is pushed by the striking vehicle. Unlike crash tests into barriers, real-world crashes typically occur at angles, and the crash forces usually are not evenly distributed across the front of the vehicle. Consequently, the relative speed between a striking and struck vehicle required to deploy the air bag in a real-world crash can be much higher than an equivalent barrier crash. Because air bag sensors measure deceleration, vehicle speed and damage are not good indicators of whether or not an air bag should have deployed. Occasionally, air bags can deploy due to the vehicle's undercarriage violently striking a low object protruding above the roadway surface. Despite the lack of visible front-end damage, high deceleration forces may occur in this type of crash, resulting in the deployment of the air bag. The airbag sensor is a MEMS acelerometer, which is a small integrated circuit chip with integrated micromechanical elements. The microscopic mechanical element moves in response to rapid deceleration, and this motion causes a change in capacitance, which is detected by the electronics on the chip, which then sends a signal to fire the airbag. The most common MEMS accelerometer in use is the ADXL-50 by Analog Devices, but there are other MEMS manufacturers as well. There was some work initially in mercury switches but they did not work very well. Before MEMS, the primary system used to deploy airbags was called a "rolamite". A rolamite is an interesting contraption that was originally developed to detect the launch of intercontinental ballistic missiles. This device was developed at Sandia National Laboratories. The rolamite and similar macro-mechanical devices were used in air bags until the mid-1990s when they were universally replaced with MEMS. Most air bags are designed to automatically deploy in the event of a vehicle fire when temperatures reach 300 to 400 degrees Fahrenheit (150 to 200 °C). This safety feature helps to ensure that such temperatures do not cause an explosion of the inflator unit within the air bag module. Today, airbag triggering algorithms are becoming more and more complex. They try to remove risks of useless deployments (for example, at low speed, no shocks should trigger the airbag to help reduce damage to the car interior in conditions where the seat belt will be a convenient-enough safety device) and to adapt the deployment speed to the crash conditions. The algorithms are considered as very valuable intellectual property. Front air bags are not designed to deploy in side impact, rear impact or rollover crashes. Since air bags deploy only once and deflate quickly after the initial impact, they will not be beneficial during a subsequent collision. Safety belts help reduce the risk of injury in many types of crashes. They help to properly position occupants to maximize the air bag's benefits and they help restrain occupants during the initial and any following collisions. So, it is extremely important that safety belts always be worn, even in air bag-equipped vehicles. When there is a moderate to severe frontal crash that requires the frontal air bag to deploy, a signal is sent to the inflator unit within the air bag module. An igniter starts a chemical reaction, which produces a gas to fill the air bag, making the air bag deploy through the module cover. Some air bag technologies use nitrogen gas. A pellet of sodium azide (NaN3) is ignited. A rapid reaction occurs, generating nitrogen gas (N2). to fill the air bag. Potassium nitrate, and Silicon dioxide are used in secondary and tertiary reactions to deal with the Sodium that is liberated. An alternative may use argon gas. Nitrogen and Argon are both harmless. However, sodium azide as a gas is dangerous. From the onset of the crash, the entire deployment and inflation process takes only about 1/20th of a second, faster than the blink of an eye. Because a vehicle changes speed so fast in a crash, air bags must inflate rapidly if they are to help reduce the risk of the occupant hitting the vehicle's interior. Once an air bag deploys, deflation begins immediately as the gas escapes through vents in the fabric. Deployment is frequently accompanied by the release of dust-like particles in the vehicle's interior. Most of this dust consists of cornstarch or talcum powder, which are used to lubricate the air bag during deployment. Small amounts of sodium hydroxide may initially be present. This chemical can cause minor irritation to the eyes and/or open wounds; however, with exposure to air, it quickly turns into sodium bicarbonate (common baking soda). Depending on the type of air bag system, potassium chloride (a table salt substitute) may also be present. For most people, the only effect the dust may produce is some minor irritation of the throat and eyes. Generally, minor irritations only occur when the occupant remains in the vehicle for many minutes with the windows closed and no ventilation. However, some people with asthma may develop an asthmatic attack from inhaling the dust. With the onset of symptoms, asthmatics should treat themselves as advised by their doctor, then immediately seek medical treatment. Once deployed, the air bag cannot be reused and should be replaced by an authorized service department. Because the air bags only deploy once, the vehicle must not be driven until the air bags have been replaced. Air bags must inflate very rapidly to be effective, and therefore come out of the steering wheel hub or instrument panel with considerable force, generally at a speed over 180 mi/h. Because of this initial force, contact with a deploying air bag may cause injury. These air bag contact injuries, when they occur, are typically very minor abrasions or burns. More serious injuries are rare; however, serious or even fatal injuries can occur when someone is very close to, or in direct contact with an air bag module when the air bag deploys. Such injuries may be sustained by unconscious drivers who are slumped over the steering wheel, unrestrained or improperly restrained occupants who slide forward in the seat during pre-crash braking, and even properly restrained drivers who sit very close to the steering wheel. Objects must never be attached to an air bag module or placed loose on or near an air bag module, since they can be propelled with great force by a deploying air bag, potentially causing serious injuries. An unrestrained or improperly restrained occupant can be seriously injured or killed by a deploying air bag. The National Highway Traffic Safety Administration (NHTSA) recommends drivers sit with at least 10 inches (250 mm) between the center of their breastbone and the center of the steering wheel. Children 12 and under should always ride properly restrained in a rear seat. A rear-facing infant restraint must never be put in the front seat of a vehicle with a front passenger air bag. A rear-facing infant restraint places an infant's head close to the air bag module, which can cause severe head injuries or death if the air bag deploys. Modern cars include a switch to turn off the airbag system of the passenger seat, in which case a child-supporting seat must be installed. Many advanced air bag technologies are being developed to tailor air bag deployment to the severity of the crash, the size and posture of the vehicle occupant, belt usage and how close that person is to the air bag module. Many of these systems will use multi-stage inflators that deploy less forcefully in stages in moderate crashes than in very severe crashes. Occupant sensing devices let the air bag diagnostic unit know if someone is occupying a seat in front of an air bag, whether the person is an adult or a child, whether a seat belt or child restraint is being used and whether the person is forward in the seat and close to the air bag module. Based on this information and crash severity information, the air bag is deployed at either a high force level, a less forceful level or not at all. Many new vehicles are also equipped with side air bags. While there are several types of side air bags, all are designed to reduce the risk of injury in moderate to severe side impact crashes. These air bags are generally located in the outboard edge of the seat back, in the door or in the roof rail above the door. Seat and door-mounted air bags all provide upper body protection. Some also extend upwards to provide head protection. Two types of side air bags, known as inflatable tubular structures and inflatable curtains, are specifically designed to reduce the risk of head injury and/or help keep the head and upper body inside the vehicle. A few vehicles are now being equipped with a different type of inflatable curtain designed to help reduce injury and ejection from the vehicle in rollover crashes. NASA engineers test the Mars Pathfinder airbag landing system on simulated martian terrain. The Mars Pathfinder lander employed an innovative airbag landing system, supplemented with aerobraking, parachute, and solid rocket landing thrusters. This prototype successfully tested the concept, and the two Mars Exploration Rover Mission landers employed similar landing systems. The Beagle 2 Mars lander also tried to use airbags for landing, but the landing was unsuccessful for reasons which are not clearly known. On American vehicles airbags are often marked SRS, which stands for Supplemental Restraint System, suggesting it should only be used in conjunction with a seatbelt and never alone. The airbag represents a big problem for the rescue teams: when it does not trigger (i.e. when it is not a front collision), it may explode at any time during the paramedic's work inside the car and the extrication of occupants.